Compare pricing for limo service in Clearwater, FL. Car service, transportation and limo rentals near Clearwater. Price4Limo has over 12,000 vehicles in our inventory with photos and prices for you to choose for your transportation needs. Getting a free quote takes less than 30 seconds and no email is required! Limo Service Clearwater, FL. Clearwater to Tampa Airport limo service provides you with a variety of transportation options available for hire on our website. With Price 4 Limo, you can get a quote within seconds by selecting a day and time for your reservation. Select from our fleet of vehicles for hire that can take you from Clearwater to Tampa Airport. We have the finest vehicles including charter buses, limousines, or private sedans that can provide transportation anywhere in Pinellas County, FL. If you are celebrating a special occasion and need a ride to the airport we have you covered. We service birthdays, weddings, corporate events, bachelor parties and more. Arrive comfortably at Tampa International Airport and let us provide you with any additional transportation services required. We provide the best limo service Tampa, Florida has. 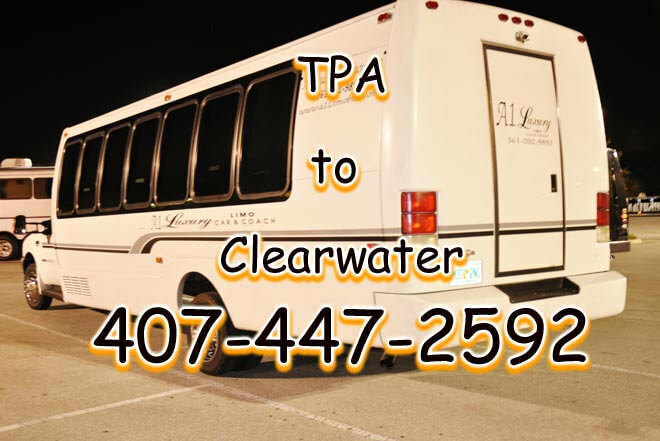 Clearwater to Tampa Airport can provide transportation services in one of our many different charter buses. Select our limo bus that holds up to 14 passenger that can enjoy the ride from back from Tampa Airport to Clearwater. Celebrate Spring Break or start a vacation as we take you to the hotel facing the beach side. When you are traveling with a larger group we can provide you with a solution and have you riding in our 20-32 passenger mini bus. Reserve our coach bus that holds 50 passengers and have us take you from W. Courtney Campbell Causeway as you go from Clearwater to Tampa Airport, you'll think you are riding in a tour bus heading out to a concert. When you make a reservation for either the mini bus or coach bus you can enjoy the large LCD screen TV as we drive you to your destination. If you are looking for a more memorable ride from Clearwater to Tampa International Airport we can have you riding in one of our luxury limos. Visit our website and reserve a Zebra Hummer Limo, Chrysler 300 Limousine, or Black Excursion limousine and enjoy the ride as we get you to TPA. Reserve a limo today as we arrive at the airport as you begin a family vacation, celebrate an anniversary, or go a honeymoon. Let your kids experience an enjoyable ride in our limousines as we take you from Clearwater to Tampa Airport it makes the start of your vacation a fun one. If you feel a limousine is just a bit too much you may want to check out our town car service to provide you with transportation from Tampa Airport to Clearwater or from Clearwater to Tampa Airport. With our town cars have our chauffeur service provide you with the travel services you are in need of. Reserve a car a few hours ahead of your scheduled flight and make your way to Hard Rock Hotel and Casino in Tampa. Enjoy your last day of your vacation in style and enjoy it with all of your friends. Whether you are looking to leave from St. Petersburg-Clearwater International Airport or Tampa International Airport our town car service can provide you with the transportation service. Don't stress having to deal with a yellow cab company as the meter updates for every block and stop that you make on your way to the airport. With us you only pay a flat taxi fare as you arrive on time to the airport. Clearwater to Tampa Airport provides you with a multitude of transportation options that can be reserved on our website Price for Limo. Get a quote within seconds and select from a limo, charter service, or car service just to name few. 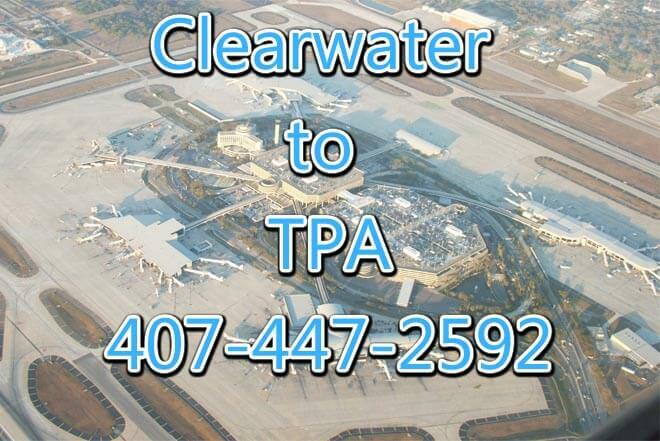 Clearwater to TPA will have you arriving on time to catch your flight on time so you do not have to deal with running to the gate and dealing with the long lines and the TSA. Once you have landed and are ready to make your way from Tampa International Airport to Clearwater we will be there to take you to your destination whether it is going home or staying at a hotel near the beach. We are your solution for your traveling needs the moment you arrive at the airport.